The SureFire FirePak Smartphone Video Illuminator is an interesting gadget for your iPhone or Android. The one that I’m demonstrating is for the iPhone. You can check out my video review on YouTube that includes a demonstration of how the SureFire FirePak Smartphone Video Illuminator works. 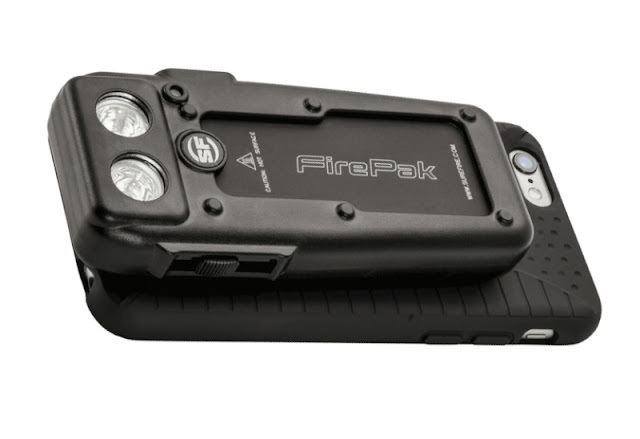 The FirePak also doubles as a phone charger and a personal safety tool. You can easily charge your phone on the go and because the FirePak has four setting ranging from 100 to 1500 Lumens, you can additionally use the FirePak as a flashlight to illuminate a walkway or kick it up to 1500 and disorient a possible predator. The FirePak fits on a specially designed, highly durable phone case, which is normally sold separately but is currently a perk included when you purchase the FirePak. The SureFire FirePak Smartphone Video Illuminator sells for $199 and you can learn more about the FirePak at SureFire!